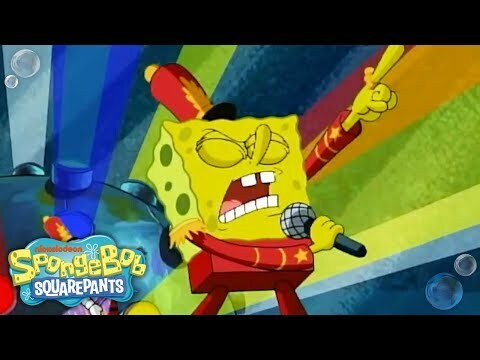 So at the end of last year, there was an effort to get SpongeBob SquarePants to perform the Super Bowl Halftime Show based on his Bubble Bowl halftime performance of Sweet Victory by David Glen Eisley. There was even a petition to get SpongeBob in Atlanta. Well, it actually sorta happened. There was a short SpongeBob SquarePants clip that was used to bring in that first rapper guy who I don't remember his name and I am totally OK with that. But what was missing was the super power ballad performance of Sweet Victory that just kind of grabs you by the balls. Thanks to this YouTuber, we can now have our cake and eat it too. They combined the actual audio from the SpongeBob performance with actual Maroon 5 footage and the result is epic. SpongeBob To Perform At The Super Bowl?